13x20x5 Astro-Guard HWP Merv 13 Replacement for Honeywell FC100A1045 | Air Filters, Inc. 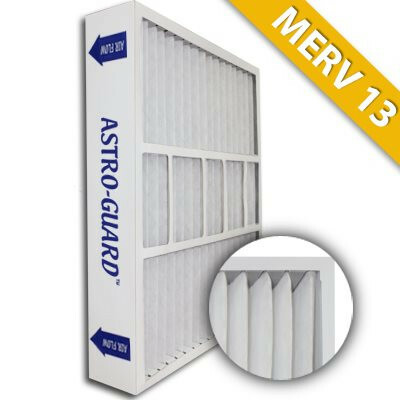 The Air Filters, Inc.™ Astro-Guard™ MERV 13 Whole House Attic 13x20x5 Replacement filters are the highest performing filters (Hospital Grade) available that can be used in all compatible size air ducts plus Honeywell™ cleaners that require a 13x20x5 filter. MERV 13 filters meets the Green Building Council's latest LEED (Leadership in Energy and Environmental Design) Indoor Air Quality Requirements for optimal indoor quality. 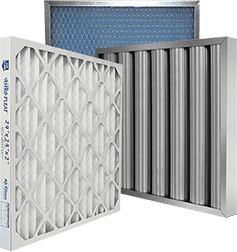 These filters meet and/or exceed standard requirements for American Lung Association® Health House® and utilizes electrostatically charged, 100% synthetic media which offers significantly higher particulate efficiency than regular poly/cotton media pleated filters, with little change in static pressure. Filter media will not promote the growth of bacteria, mold, mildew, or fungi in normal operating environments, and has not been chemically treated. This air conditioner filter should be replaced at least once per year for maximum efficiency. Filter life based on air quality. MERV 13 filters not only only reduce up to 98% of allergens and microscopic particles for both homes and businesses but effectively eliminate allergies and sinus irritation that can cause watery eyes, itchy throat, coughing, and sneezing. We highly recommend MERV 13 filters for any asthmatics or respiratory sufferers who requirer premium indoor quality in the their home or office. Air Filters, Inc.™ Astro-Guard™ MERV 13 Whole House Attic 13x20x5 Replacement filters use the optimum blend of synthetic fibers to insure high dust holding capacity and filtering efficiency. * MERV 13 whole house attic air filters media is thermally glued to Expanded Metal backing to prevent the media from sagging during the filter's use. * MERV 13 whole house attic air filters pleats are formed in a radial configuration to insure proper dust loading. * MERV 13 whole house attic air filters cartridge is encapsulated in a heavy duty die cut beverage board frame to insure filter integrity in high moisture applications. * MERV 13 whole house attic air filters face of the die cut is internally glued to the apexes of the pleats to insure maximum endurance under adverse conditions. * MERV 13 whole house attic air filters media is electrostatically charged. * MERV 13 seasonal pleated air filters contain 9 pleats per linear foot which creates a greater surface area to catch airborne particles.